Thanks for the great suggestions from DamoRC, v1.1 plans have been uploaded to the first post. The changes are as noted above, to make the fuse more of a standard FT build with a main "B" fold. To accomplish this the cockpit area is a separate piece that can either be permanently attached or held on with magnets or a BBQ skewer. I had mine as a hatch initially for rx and servo access. I also addressed the size of the graphics by enlarging the wing graphics to cover more of the wing area. Finished. Took some short cuts (didn't mount the tail servos internally). I never have great success with landing gear so she'll be a belly lander (thus the two aileron servos, one mounted atop each side of the lower wing). Had a little trouble balancing her (I can just about get her level with the ESC pulled forward, and NTM2826 1200Kv motor / 9x6 prop and a 1600mAh 3S all the way forward). Quick shot of paint, a couple of strips of red tape for some color, and a picture taken at just the right distance to hide the builders errors. Weather has not been great here so I'm not 100% certain that I will maiden tomorrow. DamoRC - you are balancing at about 1&#8221; from the LE of the bottom wing? I used a similar motor and had to push a 1300 3s further back than I would like. No way to use a 2200 which is what I wanted. That is why I had moved the mount back a little in the plans. I see your motor is all out front but the servos are much further back than mine. Perhaps that is the difference. Plane looks great. I&#8217;m suffering with weather here as well, rain all day tomorrow. Good luck with the maiden! Okay - got to maiden her today (no vid, sorry). Maiden was with the 1600mAh pulled all the way to the front. Balanced on the CG marks from the plans (so about 1" back from the LE). I would have preferred to make her a tad nose heavy for the maiden but didn't want to try her with the extra weight of the 2200mAh. She flew and survived the maiden but I will admit that I found her to be a bit of a hand full. She was twitchy in the pitch axis and I didn't feel comfortable flying her. When I cut the power way back, she floated around a lot easier. A second fight with the 2200mAh (so now a little nose heavy) was not any better and I landed her pretty quickly. She was trying to knife edge quite a lot - a little rudder trim helped. No doubt she can carry the weight though. A third flight, back with the 1600mAh this time, went pretty much as the first. I think that there maybe a number of things going on including sloppy control surface setup (both in terms of geometry and slack), too high rates on all the control surfaces (leading to pilot induced oscillations / instability), and possibly build errors (all of these are issues with my build and not the design or plans). Tonight I am going to give her the once over and carefully check the build for incidence or alignment problems, control surface slack and soften the throws etc. Sorry to hear she was a handful. My experience was super smooth with two clicks of trim. I did have low rates and about 40% expo for the first flight. Here is where I balance with a 1300 3s. 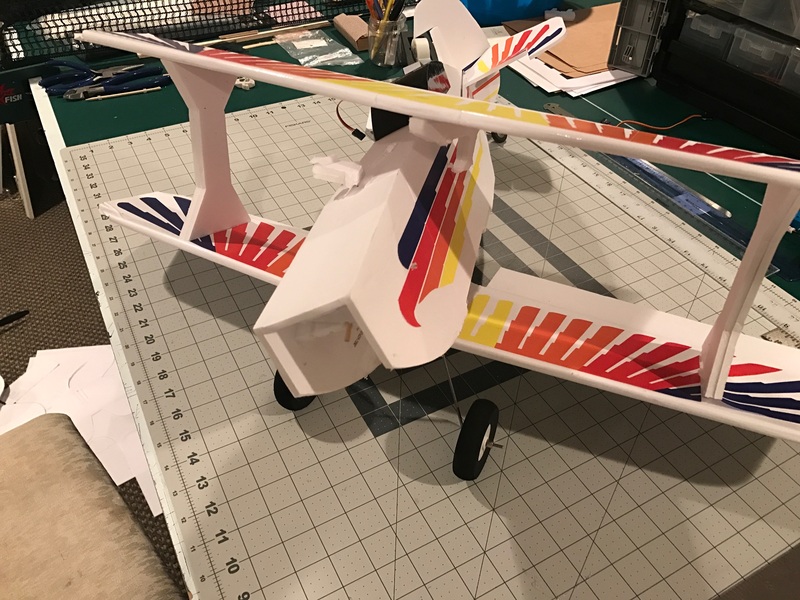 After giving her the once over after the maiden I removed any slop in the control surfaces and improved the geometry of the servo / control horn linkages in the ailerons. I checked that the wings and tail were square to each other and that the horizontal stablizer had no un-planned incidence to the wing. I cut the throws a little and added more expo. Took her out for a second test this weekend. Used only the 2200mAh to try to get her balanced. Also tried her with a couple of oz added to the nose to make her a little more nose heavy. Better flights than the maiden but still not as controllable as I would like. Again, at slower speeds she seemed to behave better. 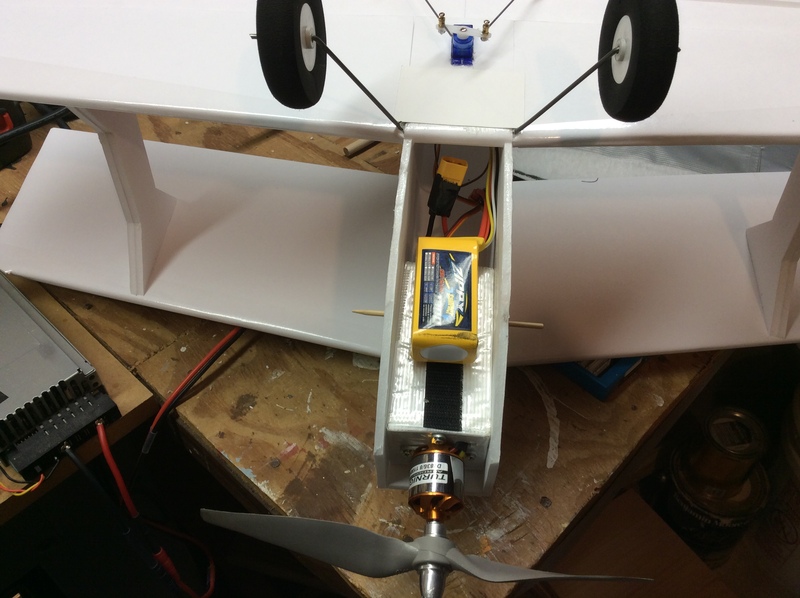 Can you check the degrees throw on the control surfaces on your model? I think I have cut the rates on the transmitter to the point that, combined with the expo, I am losing resolution at the elevator and rudder. I may need to put in taller control horns (mine are aggressively short ). Degrees max throws at your low rates would help me make sure I am setup the same way as you are. DamoRC, at low rates I&#8217;ve got 8mm of aileron travel and 11mm of elevator. Everything slightly more than doubles for high rates. Let me know if that helps. Great! Thanks for the info jpot - I will make the adjustments this weekend. Lesson learned, don&#8217;t slow down too much in a turn with a flat wing plane coming in for a landing. Wingtip dropped and straight in. Oops. Ouch! Should be a simple fix though. Is it just the fuselage that popped off? Looks like just a couple squirts of hot glue and you'll be back in business. Lesson learned, don’t slow down too much in a turn with a flat wing plane coming in for a landing. Wingtip dropped and straight in. Oops. The baby blender doesn't really drop a wing, so you should be just fine. It has a pretty beefy airfoil for its size and handles just fine at slow speed. It is a bit twitchy though, so do watch out for that. thanks for the tips! i love stow stuff with planes. what do you mean by twitchy? It doesn't like the wind much, and it's very short coupled, so it tends to have a very sensitive elevator and rudder. Luckily, that's easily tamed with some expo and dual rates. good to know. i have the qx7 so maybe 30% expo like recommended? stick to the middle of the sticks? 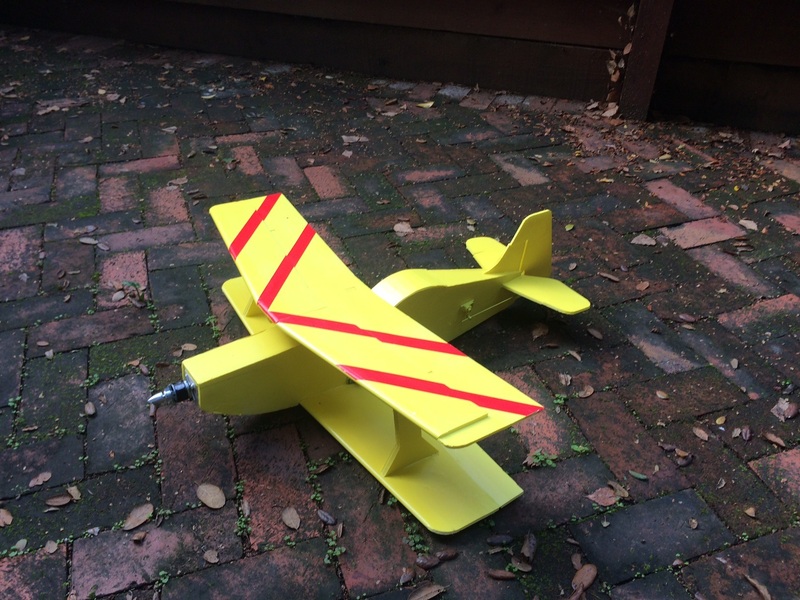 You could probably go up to 50 on the tail surfaces, but 30 will be fine for the ailerons. Don&#8217;t think I&#8217;m going to repair but maybe redesign with foldover wings. Daniel Kezar - to tame the baby blender I added about 4-5 &#8220; to the length of the fuse and also added to the wingspan. It is now my go to relaxing plane - it flys that well! Don’t think I’m going to repair but maybe redesign with foldover wings. Daniel Kezar - to tame the baby blender I added about 4-5 “ to the length of the fuse and also added to the wingspan. It is now my go to relaxing plane - it flys that well! really? it makes it that good, huh? well maybe i will try that after my first one. so did you just stretch the plans or just add it free hand or what? I just did it by hand. Basically extended the fuse by a few inches and then updated the angle from the bottom of the fuse to the new endpoint. If you are not in a rush I could probably update plans - let me know. Check out this thread starting post 169 for the visual.